Tomorrow brings the release of Faults, the directorial debut of Riley Stearns, to limited theaters, and we've already highlighted the intriguing trailer featuring Mary Elizabeth Winstead and Leland Orser. For those who don't know, the film follows a woman (Winstead) still under the mental grip of a mysterious cult who goes through a deprogramming from mind control expert Ansel Roth (Orser) at the behest of the girls' parents, but with great risk to her health. It certainly looks like one of those indies you'll want to go out of your way to see, and as one last effort to hype the film, check out this new stylish illustrated poster. 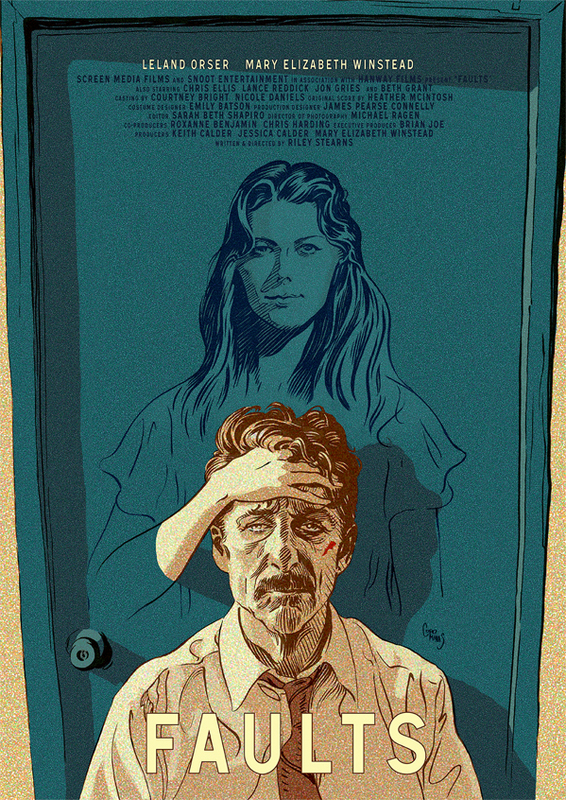 You can still watch the trailer for Riley Stearns' Faults right here. Claire (Mary Elizabeth Winstead) is under the grip of a mysterious cult. Desperate to be reunited with their daughter, Claire’s parents set out to recruit Ansel Roth (Leland Orser), one of the world’s foremost authorities on mind control. But Ansel’s specialty, deprogramming cult members and returning them to their families, is not an exact science. Now, even his own book publisher is looking to break his legs. Ansel kidnaps Claire, who reveals herself to be a formidable challenge; her belief is unshakeable and her logic is undeniable. A battle of wits develops between the two as they delve deeper and deeper into each others minds. Riley Stearns writes and directs Faults which Screen Media Films releases on March 6th. Well? Woah...that is impressive. MC Escher would approve...maybe.